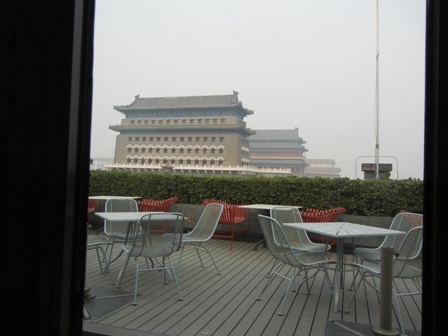 As some of you know already, one of my favourite restaurants in Beijing is Capital M at Qianmen with its terrace overlooking Tiananmen square. During a trip in mid-December, I had the opportunity to dine their again. It was another one of these occasions when I was ready for a treat. 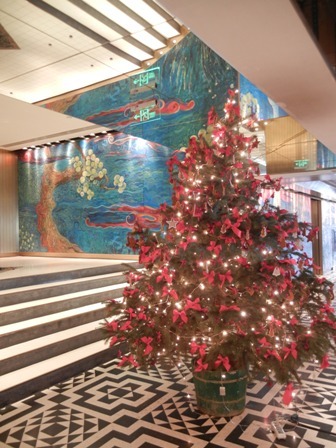 A Christmas tree in the hall welcomed me this time. The whole of Beijing was full of Christmas decoration and Christmas songs were blasted from every loudspeaker in town, so it seemed. I had come from the Enlightenment exhibition at the National Museum of China, and craved for a meal in a nice location, so my natural choice was Capital M at the south end of Tiananmen square with its warm atmosphere and splendid surroundings. The art of the enlightenment exhibition, by the way, is a wonderful display of one of the most significant times in European history, and I was glad that I had finally found the opportunity to attend the event which is basically celebrating human freedom. 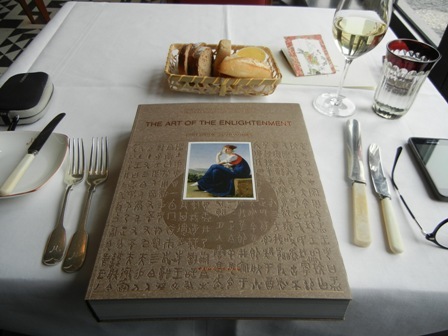 I had even bought the catalogue and had ample time to browse through it while dining at Capital M.
It was not difficult to choose my meal. Unfortunately, I was by myself and hesitated to order a bottle of wine. Instead I went for the house wine by the glass which allowed me to taste two wines. Naturally, I went for the house wine which I knew from my earlier visits. The Capital M house wine comes from Angoves, a family-owned and run winery in South Australia has supplied Capital M for two decades already. I love the wines made by Angoves Family Winemakers which celebrated its 125 year anniversary in 2011. Capital M’s wine list is very impressive. There is a short list with about 300 wines to choose from and a long list which makes you faint in delight. This is just an awesome dish, smooth and full of flavours. It dissolves in the mouth and the white wine was just the right counterpoint. I did not feel “meaty” and therefore went for the non conventional pasta (how can you put pumpkin in a pasta?). 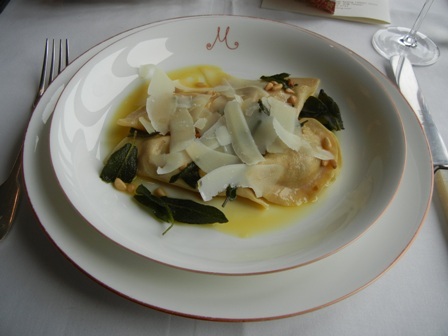 This is a wonderful composition of different ingredients with distinct flavours. The sage and butter sauce blows you away. My taste-buds had a wild party. The spiciness of the Shiraz accentuated the experience. 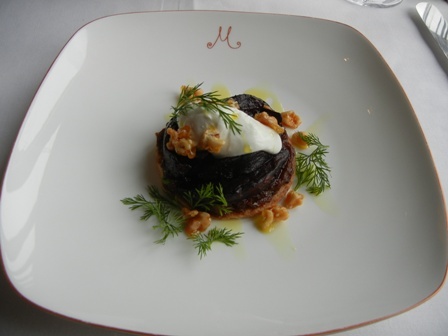 Capital M has been founded by Michelle Garnaut, the well-known Melbourne-born restaurateur, and is the recipient of an impressive list of awards. I also like the GM, Espen Harbitz, who is always present, greeting the guests and asking for feedback. 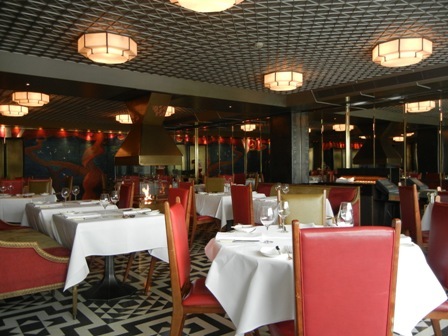 If you should visit Beijing in the water dragon year, a meal at Capital M should be part of your itinerary. 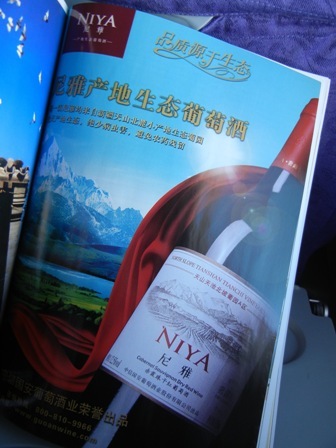 The other day when I travelLed in China, I realized that there are quite a few advertisements regarding grape wine displayed in prominent public places. I found some attractive ads on a rotating billboard which I photographed. 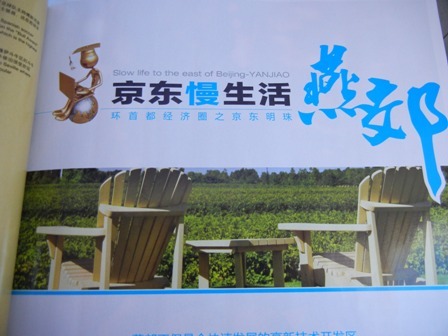 A glossy airline magazine had also a few ads which I found interesting. The first four pictures below show caucasian men looking at wine bottles and/or seem to sample wine. The men are of a mature age and seem to know what they are doing. They emit the scent of experts, professionalism and sincerity suggesting that we the viewers can trust them. 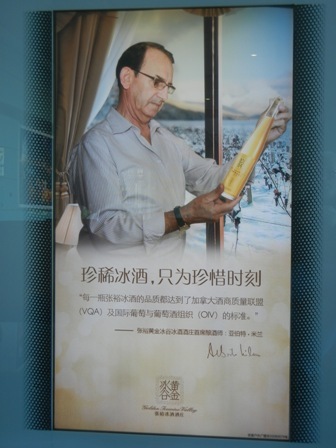 I found the ad for icewine intriguing. The three others deal with red wine, the most appreciated grape wine in China. 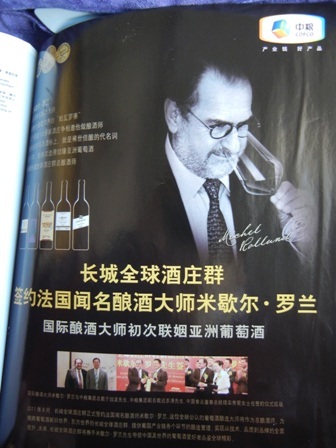 The next Three pictures show specific wine brands promoted by the ad. 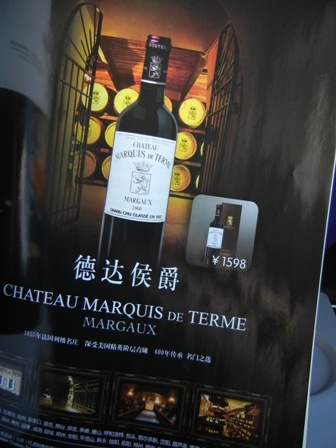 Two of them are for Chinese brands, Chateau Junding and Niya, the thrid is for a French wine Chateau Marquis de Terme, Margaux? 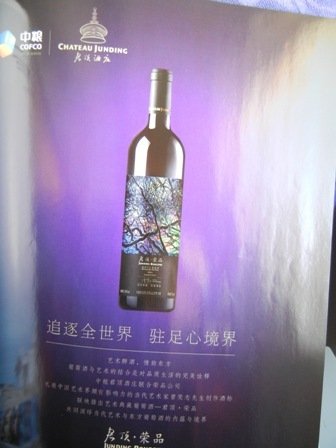 The price of 1600 Yuan is not insignificant, but many Chinese consumers go for the most expensive Frnech red wines. As almost everything in China wine consumption is booming. 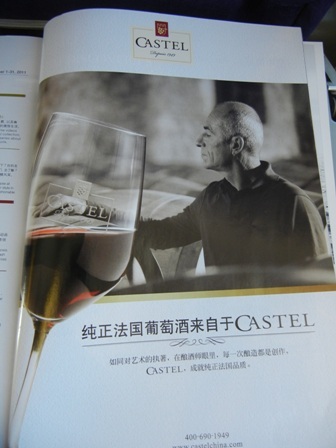 In 2012 China has overtaken the United Kingdom as the fifth largest wine consumer in the world. 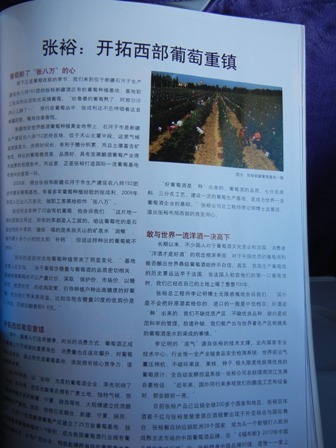 The last two photos from an airline magazine cover a specific winery and wine region and invite people to visit the place. This is wine tourism in the making. 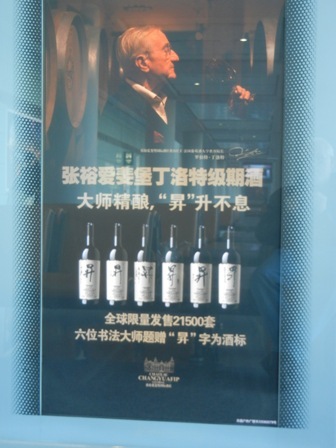 Given the fact that many prospective Chinese investors are visiting vineyards and wineries in Australia these days, and more and more buyers of Australian premium wines come from China, it is worthwhile to have closer look at the Chinese wine industry, wine consumption habits, change of tastes and many other issues related to the appreciation of fine wine. 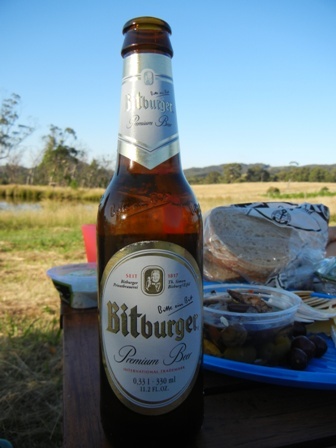 When we are on vacation in Australia, we are always trying to visit some of the many wineries in our vicinity. From Glenburn the Yarra Valley is just a “stone’s throw” away so to say; a 30 to 40 minutes drive will drop you at the doorsteps of most of the famous Yarra Valley wineries. However, when it comes to the execution of our plans, we more often than not fail. The Christmas holidays in 2011 were no exception. But at the last minute, we dashed along the Maroondah highway to buy a couple of bottles of wine we could take back to Bangkok. The Oakridge Winery was our destination. 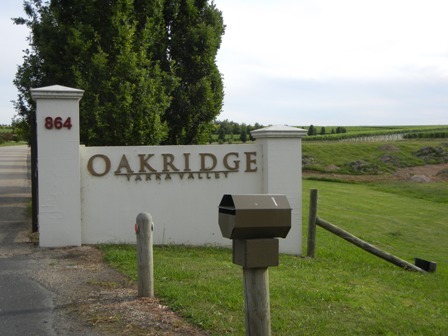 We knew through the grapevine that Oakridge had won the prestigious “winery of the year award 2012”. 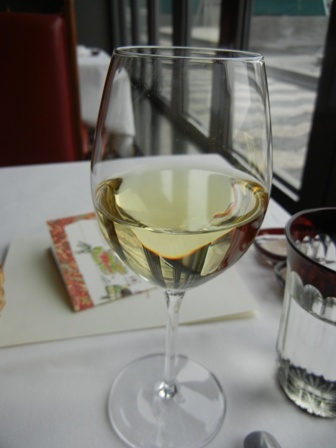 Moreover, the critics also praised the 2010 Chardonnay 864 of the Lusatia Park Vineyard. The newly invented “twilight cellar door”, open until dark, made the visit possible, because it was already 18 h (most wineries close at 17 h) when we got there. 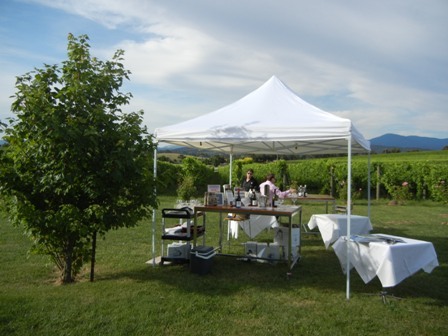 We rocked up at the vineyard where a function took place but did not miss the “tent” with the mobile cellar door. 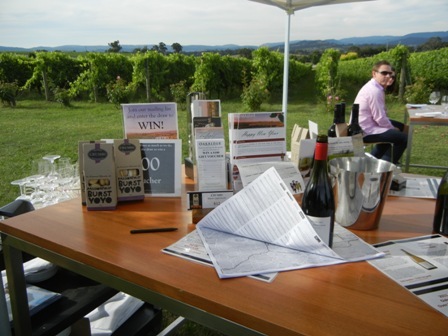 Oakridge has become an icon in the Yarra Valley. 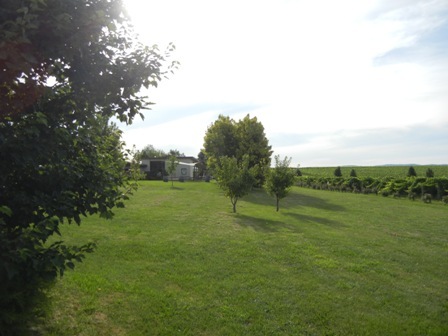 Since 1978 the family-owned winery produces premium and award winning wines on about 10 ha of land. Since 2002 David Bicknell is the chief wine-maker at Oakridge. 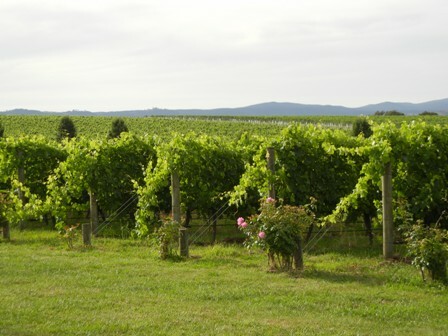 The Yarra Valley is considered to be a cool climate region. 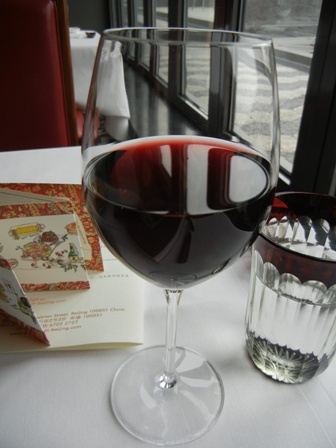 Its wines are often compared to the wines of Bordeaux, Cotes d’Or and the Northern Rhone. Especially the Pinot Noir and the Chardonnay wines of Oakridge are very remarkable, but also some of the other wines win top awards for instance the 864 Syrah (gold in 2011). From the Oakridge website you can find out more about the awards and the awards performance of the Oakridge wines. Oakridge’s premium brand is the 864 series. Unfortunately, the Chardonnay we intended to buy was not available at the twilight cellar door that day. We were pressed for time but tasted another one of their premium wines, the ‘2010 Oakridge Lieu-dit Chardonnay’ from the Duck’s Lane vineyard. Delicious. By the way, it is scientifically proven that wine judges cannot replicate consistently the same rating in replicated test series. And ever since I red Daniel Kahneman’s book “Thinking fast and slow” I know the reasons which are neatly explained by “prospect theory”. Anyway, we bought a bottle of this gorgeous drop. She was one of only four in our luggage to make the way to Bangkok. I will tell you how this ‘2010 Oakridge Lieu-dit Chardonnay’ tasted when I open this treasure. For now it is safely stored in my wine fridge. Stay tuned. The other sure think is that we need to come back to Oakridge for a proper tasting. You are cordially invited to join us. Summer in Australia is also the main barbecue season. We took the opportunity of the great meat supply to indulge in quite a few feasts. This also gave me the opportunity to train in one of the major male Australian skills: operating the barby in masterly fashion. Where do we get the meat from, you might ask? 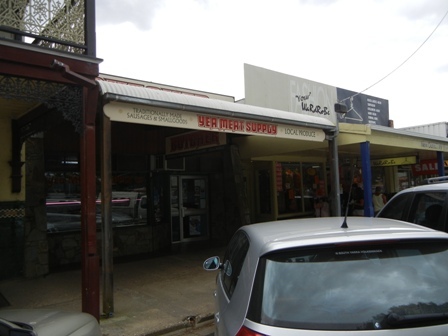 Well, the butcher shop in Yea (in the 19th century known as the Muddy Creek settlement) is our destination when shopping for first class meat. Two brothers are running the shop, and they are very friendly and helpful to find the right piece of meat for the planned occasion. The quality of their produce is outstanding. 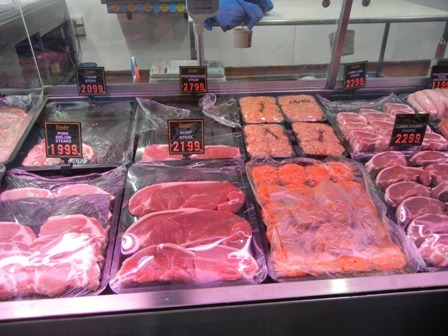 We had a few big occasions for which we needed beef, lamb, pork, chicken and sausages. Whatever we took home was just super-jum. Juicy and fresh, tasty and nurishing. 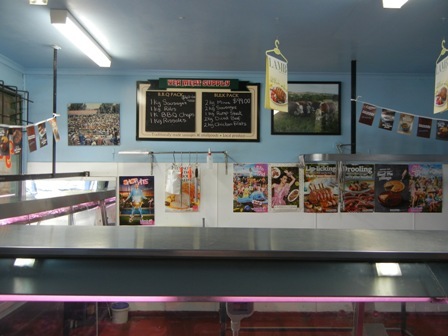 That’s the place to stock up if you need quality Australian meats.Check it out when in Yea. I am back at work in Bangkok after a short and exciting assignment in Myanmar. Today was my first day at the office desk. I was staring into the computer screen, reading and answering e-mails, signing contracts and organized many odd and less odd work related things. I usually skip lunch when working in my office. Instead I eat a muesli bar or some fruit. Green mango is one of my favourites. Naturally that I was reminiscing about the recent past, the glorious days of our Christmas vacation on Two Hills Vineyard. 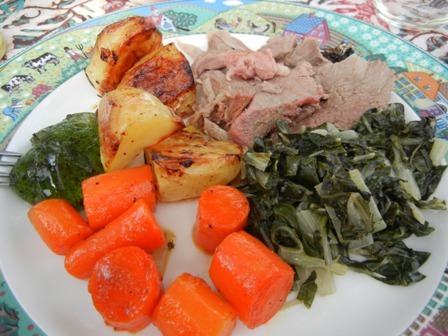 One very memorable meal was an Anglo-Saxon kind of food combination with roasted potatoes, silver beet, carrots and a leg of lamb. 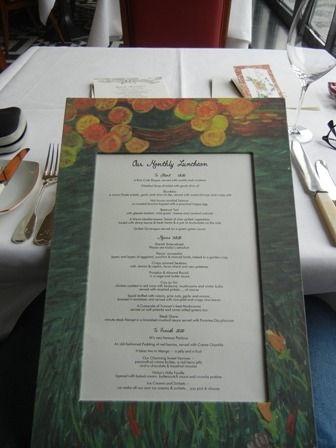 From the pictures you can see how delightful these dishes looked like. But can you also imagine the taste? Gorgeous food, awesome stuff. The question what wine should we have with this meal was easy to answer. First of course our own 2004 Merlot. But we wanted also something else, something strong and refined, a wine with zest and character. 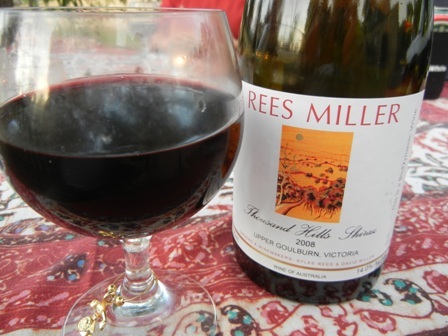 I selected a ‘2008 Thousand Hills Shiraz’ by one of our neighbouring vintners from the Yea area, the Rees Miller Estate. I have written a few blog entries about wines produced by Rees Miller Estate ( I also love their Merlot), and I do not want to repeat myself. 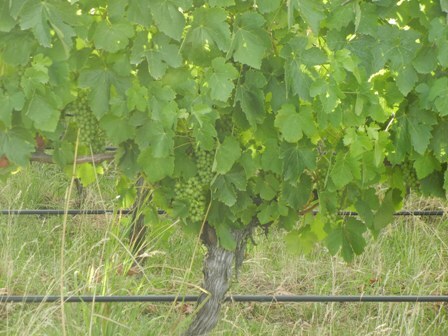 Silke Rees and David Miller produce some of the best bio-dynamic wines in our region. The ‘2008 Thousand Hills Shiraz’ is just a wonderful wine, full bodied and spicy with lots of fruit and an intense finish. 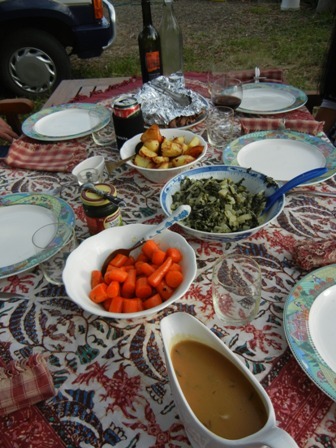 It was just the ideal accompaniment for the lamb, the potatoes and the veggies. Frankly speaking it was one of the best red wines I drank in 2011. Watch Rees Miller and their wines. You are currently browsing the The Man from Mosel River blog archives for January, 2012.